For more than four centuries, immigrants from all over the globe have become the people of New York. New Yorkers have brought their traditions with them from all over the globe. We celebrate our shared ancestral tapestry at cultural sites, performance centers, museums, parades and festivals all year long. Many fascinating New York cultural sites offer you the opportunity to learn more about your own heritage and get acquainted with many others. The Tenement Museum and the East Village/Lower East Side Historic District give an insider’s view of what life was like for early New York City people. Further upstate, you can explore the traditions of Irish, Italian, Slovakian and Welsh immigrants at Slate Valley Museum. Music is the universal language and two of Hunter Mountain’s popular summer festivals – German Alps Festival and International Celtic Festival – are instant cultural immersions into music, food and traditional ways. On Long Island, the longstanding Scottish Festival and Games, and the Annual Tartan Day Parade, are great showcases for bagpipe music. Or, you might want to attend the annual Native American Dance & Music Festival at Ganondagan State Historic Site in Victor. You can hear ancient legends from Native American storytellers at the Iroquois Indian Museum in Howe’s Cave; experience a sweat lodge at Turning Stone Resort Casino; or visit Seneca Iroquois National Museum to see Longhouses and cultural exhibits. The annual Juneteenth Festival in Buffalo, the largest festival of its kind, celebrates the positive contributions of African Americans to our American way of life. The weekend includes a Heritage Tent, African Drum and Dance Lessons, Underground Railroad tours, entertainment, and many fun-filled family-oriented activities. If you’re interested in learning about Caribbean, Latino and Latin American traditions, El Museo del Barrio is the place to visit in NYC. Or, check out Tibetan culture at Jacques Marchais Tibetan Museum. 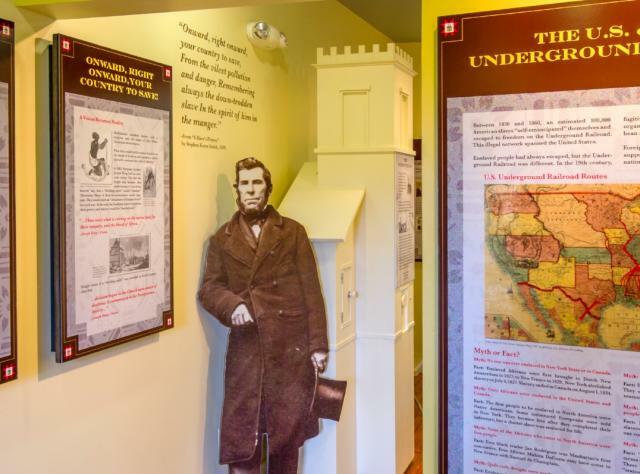 There are several designated Underground Railroad sites all across NY state; you can also visit the home of abolitionist Harriet Tubman or the Brooklyn village of Weeksville, which was a free African American community in the 19th century. Statewide, celebrations range from Lunar New Year festivities in Chinatown (one of NYC’s first neighborhoods – find out more on Public Walking Tours of Chinatown), to Cape Vincent’s annual French Festival, which features French pastries, music, parade, arts and crafts and the French Festival Queen. Albany’s Tulip Festival honors our early Dutch heritage with over 100,000 colorful blossoms. If it&apos;s true that people become friends when they dine together, you can make friends over meals all across New York. From New York City -- where restaurant fare ranges from African to Ukrainian and Food Tours of New York are a delicious way to explore ethnic communities and try new foods – to Buffalo, where you can sample specialties like Polish Chrusciki pastries and homemade pierogies at the Old World-style Broadway Market.